Of Horses and Men: I Graduated! From counseling that is. I went for my last session last night and basically I got kicked out. I have found that over the weeks we have had less and less to talk about and instead of the hour flying by and not wanting it to be over, the time would slow down and we'd always be done 5 minutes early. My counselor believes that I have the skills I need to succeed and my plan of action for myself is solid. I quietly asked her if I could call and talk to her if things got rough again and she said ofcourse. She said that I have done a lot of work and that she really has nothing else to offer me. It was weird walking out of her office without a next appointment scheduled. She gave me a big hug and said that this is one of the happiest times that she has with clients even though it can be sad because we don't see each other all the time now. I promised to keep her updated by email and she might come and see me marshal at the fair. After counseling I zipped to the barn, got Possum out, quickly groomed him and went for a ride in the arena. I had forgotten my spurs so I knew it could be a tough ride. Many people are under the impression that spurs are for speed, and in some cases I will give him a litttle poke if he starts to get behind my leg or to go a little more forward. However the biggest thing I use my spurs for is bending and making sure that he doesn't collapse his ribs or tilt his hip and also for turning. If Possum isn't bending correctly or is crooked he will easily lose a canter lead behind. Using spurs helps to keep him right between my legs and on the aids. They also can help with crisper upward transitions. Here is a pic of the spurs that I wear. So it was a rough ride because he was a little dull to my leg aids. And also working on our flying changes on his bad side I really have to use a strong outside leg while also balancing him with my inside leg to make sure that he is completely straight for the change and not tipping his hip in. So we also worked on lengthening and shortening strides in between lines. Since he was such a speed deon at the show I started out by taking a stride out of a 3 stride line, therefore making it 2 strides. He did really well and after a few times started to get tired, so when I asked for 4 strides in the line he was pretty compliant. My roomate was also riding her mare and they did pretty well. SO lesson learned is to not forget your spurs at him in your show boots. I could have borrowed someone else's, but I was lazy and wanted to try it. After the barn I took the dogs and picked up a pizza for dinner and went to "G's" and took a quick shower and watched a movie. It was nice and relaxing and "G" was all lovey and cuddley. I started to fall asleep so we shut it off and went to sleep. It was nice and peaceful and I got woken up this moring with hugs and kisses from him and the dogs. He is just being so sweet lately. He texted me this morning and said that he misses me and wants a kiss. He called me on a road test just to say hi. He has a job to do after work tonight so I'll probably go to the barn and maybe ride or hang out. Also just talked to the barn owner and one of her 3yo's that got porcupine quills in her leg 2 months ago and is not doing well again. When it first happened the vet came out and had to sedate her to get the rest of the quills, there was about 70 and right behind her knee on her right leg. We have been treating her with antibiotics and it was getting better, although slightly larger than the other. The other day she wouldn't even put weight on her leg and it had puffed up huge. We gave her some more antibiotics and figured that maybe there was a stray quil that was trying to work it's way out. Well after a couple of days she hasn't really improved so the owner is trailering her to the equine hospital to be looked at further and possibly surgery. So please keep your fingers crossed. She was conceived and born on the farm and is such a sweet mare who was doing well in her training. She is a perch/TB cross and her name is Morgaine. Also the answer to my little poll. Possum and I have jumped 4'6" as the highest to date. 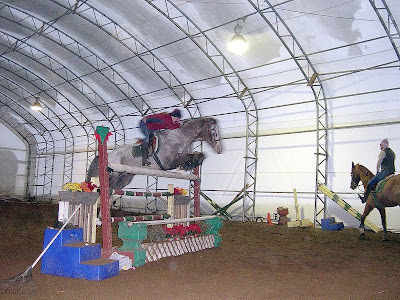 Here is a pic of that jump from our barn Christmas party in Dec. 2007 . Thanks everyone who guessed. We hope to jump bigger in the near future and really see how high we can go. We cleared this jump in the pic but I was too chicken to raise it to 4'9" so left it at that. Yeah forgetting my spurs always puts me in for a workout too! Ah well - sounds like you had a good day and congrats on your last counseling lesson! Big step - you have a right to feel proud! It is good for me to read about your use of spurs because that is the same use we have in western riding. Riding with spurs and using spurs are 2 different concepts. I love that last photo. Congrats on the therapy graduation! (And cute pic, by the way.) I'm in the same boat and am also getting ready to "graduate." I've only been in therapy for about 5 months to get a grip on a specific issue, and I normally don't consider myself a "therapy person," but it's still a bit scary to leave! I'm also happy that it was my therapist who brought up the "I don't think you need this anymore" topic. Once upon a moon I had a therapist who wouldn't let go (read: she wanted that check every two weeks!) even though I was fine. That kind of soured me on the whole therapy thing, but now I'm happy to see my therapist recognizes I'm ready to move on. So anyway, congrats! !